Marion Buitelaar at Melitas Marine tells me of a significant price cut to the 50m sailing yacht Pantheon. Built by Greece's Perama yard in 2004 specifically for the charter market, this superyacht accommodates 50 guests in 25 staterooms, all with ensuite bathrooms. 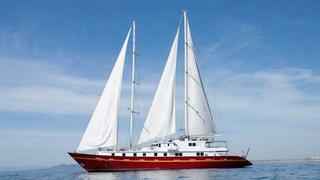 She cruises at 12.5 knots under power and up to 14 knots under sail. Recently the subject of a six-month major refit, Pantheon's price has come down from $9.9 million to $8.5 million.